The conclusion for the Galaxy S9 is always the toughest part to write as it’s where we have to reconcile all the pros and cons of the device and making a verdict on its value as a product to customers. In terms of design, the S9 iterates on the S8 and I think that’s definitely a positive until Samsung somehow produces a better design overhaul. The changes we find here aren’t exactly ground-breaking and most people will get used to them very fast. The fingerprint scanner location is among the biggest ergonomics changes and while for me personally it didn’t do much, there’s plenty of people who find it an improvement. The speaker sound quality of the Galaxy S9 is a massive improvement and this is now by far the best sounding smartphone device. The stereo speakers as well as the audio processing tuning along with the improved main speaker design all just provide a much better experience. I may not have covered this in the introduction, but Samsung’s choice to retain the 3.5mm jack is absolutely the right thing to do. I’ve got very strong feelings about companies’ rationales behind removing the headphone jack and find their reasoning either misguided or outright misleading, and just very anti-consumer choice. Here’s to hoping that Samsung sticks with it in the future, and as absurd as this is that I have to praise them for it, I have to do it to ensure that companies listen. 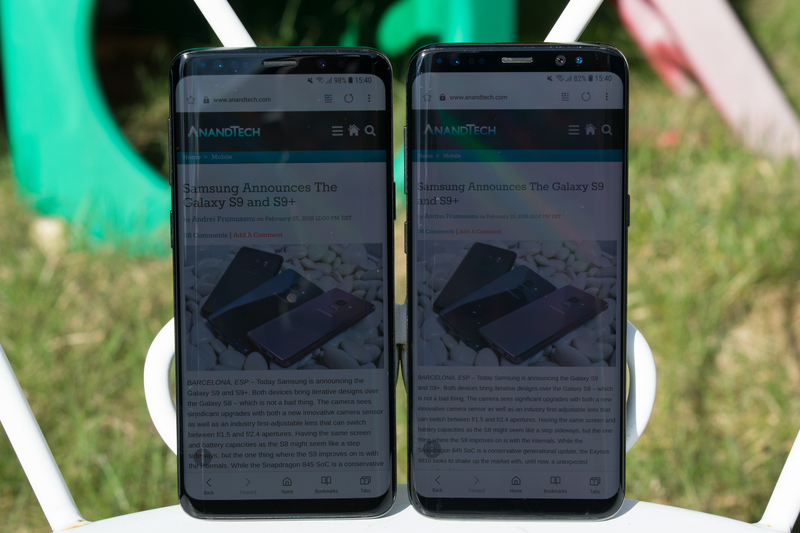 The screen of the Galaxy S9 holds very little surprises as it has only marginal improvements over the S8. It’s still among one of the best screens on smartphones, and honestly there’s not much more to say. The camera of the Galaxy S9 for me had some high points and some low points. The high points are that the variable aperture of the S9 has real benefits and direct advantages in picture quality in day-light shots. The S9’s reduced usage of sharpening provided the cleanest pictures among all smartphones and thanks to its improved sensor its effective spatial resolution is actually higher than some higher resolution camera devices. The low-light shots also come with a quality improvement over the S8 – although it will depend on the lightning and scene to notice them at their full effect. Right now the S9 has the best low-light camera. While the hardware of the S9’s camera definitely deserves praise, the software has notable issues in daylight shots. The Galaxy S9 has a very bad tendency to overexpose and compress the image’s dynamic range. In Pro mode these issues largely go away, but for the Galaxy S9 to offer a better point-and-shoot experience than the S8 or the new iPhones, Samsung needs to rework its camera calibration in Auto mode as right now it can be the odd one out in terms of results. Finally, the biggest story for the Galaxy S9 is its big contrast in terms of SoC hardware. Ever since we first heard about the Exynos 9810 we had very large expectations and we knew there would be some tangible differences between Exynos and Snapdragon variants. The expectations couldn’t be more shattered than the results we got. While the Snapdragon 845 variant of the Galaxy S9 performed largely as advertised and as we had been told to expect by Qualcomm, the Exynos 9810 failed to live up to its hype in real-world scenarios. Effectively, the Exynos 9810 variant and as evidenced by all the data we collected, is the slower variant of the two. The root cause here has been identified as the extremely conservative scheduler and DVFS mechanisms which essentially nullify any advantage the new M3 cores have in synthetic benchmarks. In 3D benchmarks, the Exynos 9810 posted very healthy efficiency improvements and even sometimes managed to catch up to last year’s Adreno 540 – something I hadn’t expected. Qualcomm’s new Adreno 630 raises the bar in terms of peak performance, however the promises of increased efficiency have not materialised in the commercial hardware as the performance boost comes at a cost of increased power. Effectively, when looking at sustained workloads, the Snapdragon 845 isn’t any faster than the Snapdragon 835 in its GPU department. Fortunately for Qualcomm, they’re still in the lead and this is not a deal-breaker for the Galaxy S9. While the performance advantage of the Snapdragon 845 variant over the Exynos 9810 variant is something we could live with, the battery life results of the Exynos is definitely a deal-breaker. I’m not sure of the root cause here and whether it’s something that can be fixed by software, but showcasing such a battery runtime regression over its predecessor is universally something that we can all agree on as not acceptable for a flagship device. Based on our testing, it’s especially in heavy use-cases where this will most evident. The Snapdragon 845 variant performed as expected in the battery life tests. For readers in markets with the Exynos variant I need to take a slightly different tone. Make no mistake as I say that the Exynos S9 is by far not a bad phone. If you come from older generation devices you will see significant upgrades, but as a flagship coming at a price premium we expect a no-compromise device, and here is where the Exynos S9 doesn’t tick all boxes. The battery life regression that we measured is the single most concerning aspect of the device. 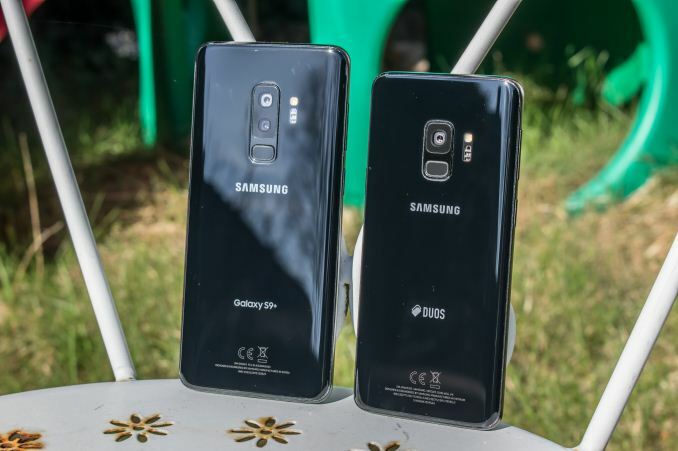 Here buyers will need to consider the device with caution and well-thought out consideration and should maybe apply a wait & see approach over the coming months – for one to see if Samsung resolves the issues via software, and secondly, to await the release of competitor’s new product lines for possible better alternatives. Thanks for the article, it's great! I found this in the article: "I also have to remind reader that the devices were actively cooled in a reduced temperature environment, this is because the whole benchmark run takes 2-3 hours and we’re trying to look at peak performance. "